In the heart of the cosmopolitan capital of Oranjestad, with stunning Caribbean views and a design and décor to reflect the breathtaking surroundings, the Renaissance Aruba Resort & Casino features 556 totally renovated rooms and suites in two distinct settings — the Renaissance Ocean Suites and the sophisticated, adult-exclusive Renaissance Marina Hotel. 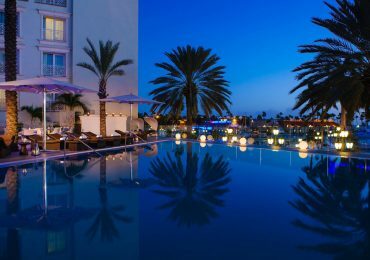 Thrill to the energy and excitement of high stakes casino gambling at the Renaissance Aruba Resort & Casino, where guests enjoy access to not one, but two state-of-the art casinos. Open to all Renaissance guests 18 and over, each casino offers the full range of popular table games, along with live entertainment and fabulous restaurants and bars. Try your luck in a casino where winners are not only welcomed, they’re celebrated every night! The 15,000-square-foot Crystal Casino offers 24-hour gaming in an elegant yet laid back atmosphere, with live entertainment from 11pm – 3am daily (except Mondays). Lounge with food served till 6 a.m. The 11,000-square-foot Seaport Casino is the only waterfront casino on Aruba. In addition to the traditional table games, the casino offers a race and sports book with live satellite links to most major events – all starting at 10 o’clock every morning. Overlooking the marina and bustling boulevard, L.G. Smith’s Steak & Chop House offers a signature fine dining experience featuring fresh, certified Angus Beef and an extensive selection of international wines. Leave the cares of the world behind as you venture over to an island exclusive to Renaissance Aruba Resort & Casino guests. Renaissance Island features Aruba’s only private beaches and is just an 8-minute water taxi ride away. Here lies a true oasis with family-friendly beaches or beaches just for adults. Pamper yourself at the private Spa Cove, play a game of beachtennis, sit down to the delicious lunch specials at Papagayo Bar & Grill or have a drink at our newly added Mangrove Beach Bar, or just lie back and let the sun caress you. A day on Renaissance Island is a day well spent. The Ocean Suites offers 259 spacious one-bedroom suites with king-sized beds, expansive bathrooms and living rooms with Queen sofa beds. Additional “touch of home” comforts include wet-bars with mini-fridges, microwaves, high-speed Internet and private balconies or patios. Each room offers stunning ocean and pool views or soothing park and island views. Available exclusively for adults over 18 years of age, the Renaissance Marina Hotel features 297 rooms with King-sized beds or two double beds. Private French balconies and expansive windows welcome in the beauty of the Caribbean coast. Guests can choose rooms with sweeping views of the ocean, the sparkling cityscape of Oranjestad or the hotel atrium overlooking the water launch. Each hotel destination has been designed to be an oasis of luxury and tranquility, with every amenity required for a relaxing stay.